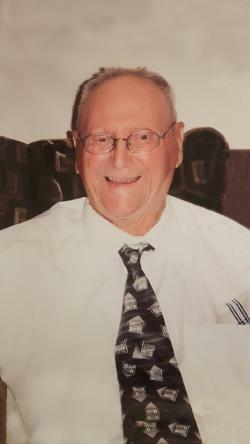 William Mary O’Keefe, 104, passed away peacefully on January 30th, 2019, surrounded by his family, at the Beachside Manor Seniors Residence in Placentia, following a brief illness. Predeceased by his loving wife of 71 years, Martha Anne, parents David and Mary, brothers Aloysius, and Arthur, sisters Annie, Imelda, and Loretta, and sons David and Edward. William will be remembered as a man who loved his family first and foremost, and the outdoors, hunting and fishing on the west coast of Newfoundland. William was a devoted and loving husband, father and grandfather. William is survived by his brother Clem and sisters Evelyn and Hilda, son Donald, and daughters Alfreda and Margaret, grandchildren Paula, Darren, Jodi, Stephanie, Jennifer, Sabrina, Douglas and Jason, special niece Ellen, and a large family circle of nieces, nephews and great-grandchildren. Funeral arrangements entrusted to Maher’s Funeral Home, Placentia and Country Haven Funeral Home, Corner Brook. Visitation to take place at Maher’s on Friday, February 1st from 6pm to 9pm. Mass of Christian Burial to take place 10:30am on Saturday, February 2nd at Sacred Heart Church, Placentia. A second visitation to take place at Country Haven on Monday, February 4th from 6pm to 9pm. Interment to at take place at Mount Patricia Cemetery in Corner Brook on Tuesday, February 5th. Donations to the Canadian Heart and Stroke Foundation in lieu of flowers are kindly accepted.